astronomical alignment as the 3 main pyramids at Giza in Egypt. The Thornborough Henges are an unusual complex of three aligned henges near the village of Thornborough and close to the town of Masham in North Yorkshire, England. The henges are thought to have been part of a Neolithic and Bronze Age 'ritual landscape' comparable with Salisbury Plain and date from between 3500 and 2500 BC. This triple henge alignment has been called 'The Stonehenge of the North' and has been described by English Heritage as the most important ancient site between Stonehenge and the Orkneys. The three henges are almost identical in size and composition, each having a diameter of approximately 240 metres and two large entrances situated directly opposite each other. The henges are located around 550m apart on an approximate northwest-southeast alignment, although there is a curious 'dogleg' in the layout. Altogether, the monument extends for more than a mile. The Central henge lies on top of an earlier Neolithic cursus monument and recent investigations have revealed that the area saw considerable prehistoric activity. Archaeological excavation of the central henge has taken place. It has been suggested that its banks were covered with locally mined gypsum. The resulting white sheen would have been striking and visible for miles around. A double alignment of pits, possibly evidence of a timber processional avenue, extends from the southern henge. The 'dogleg' in the layout appears to cause the layout of the henges to mirror the three stars of Orion's Belt. The exact purpose of the henges is unclear though archaeological finds suggest that they served economic and social purposes as well as astronomical ones. The Northern henge is currently overgrown with trees but is one of the best preserved henges in Britain. The Central and Southern henges are in poorer condition although the banks of the henges are still quite prominent, especially in the case of the Central henge. To gain a full appreciation of the scale of the monument it is best viewed from the air. All three of the Thornborough henges and the narrow strip of land connecting them are Scheduled Ancient Monuments. However, the land is privately owned and there is no official public access. Despite this, the site does have a steady stream of visitors throughout the year. Since 2004 there has been an opportunity for public access to the central henge, which is owned by Tarmac Northern Ltd. to attend the celebration of the pagan festival of Beltane. 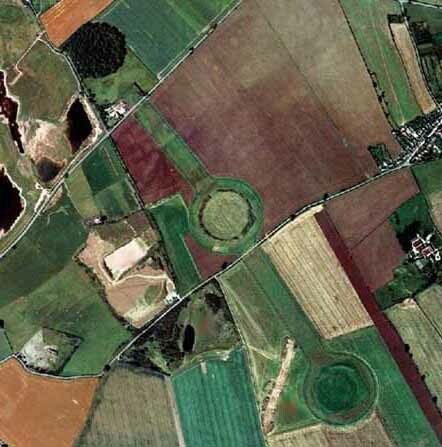 On May 1st 2005 this event was attended by around 150 people from across the north of England.Extensive quarrying has destroyed much of the monument's setting to the north and west of the henges. The site lies within the wider Nosterfield quarry area being exploited for gravel by Tarmac Northern Ltd. Although the henges themselves are not threatened, Tarmac now wishes to extend its quarrying operations to a 45 hectare site less than a mile east of the henges known as 'Ladybridge Farm'. Preliminary investigations of this area of land to discern its archaeological significance have suggested that it may have been a location of ritual Neolithic encampments, possibly used by those people who built or visited the henges. Opponents of the scheme claim that if permission was granted for this area to be quarried, much of the remaining contextual information about the henges would be lost. A campaign led by local people and concerned archaeologists is attempting to persuade Tarmac and North Yorkshire County Council to guarantee the protection of the area. British planning and archaeology guidelines prefer preservation in situ of archaeological remains. In cases where this is not possible, such as quarrying, preservation by record is an option, involving archaeological excavation. Campaigners argue that further excavation and subsequent quarrying will destroy the ritual landscape completely. In 2002 Tarmac Northern Ltd. expressed an intention to apply for planning permission to quarry Thornborough Moor, thus intending to quarry right up to the edge of the designated scheduled monument area. In March 2005, Tarmac stated it would not seek to apply for planning permission to quarry this site for at least ten years, the period covered by North Yorkshire County Council's Minerals Plan. In February 2006 North Yorkshire County Council turned down Tarmac's application to expand quarrying to the Ladybridge Farm site. Tarmac have announced that they intend to appeal against the decision, holding that their plans do not threaten the henges themselves and are vital for the local economy and preserving the jobs of around 50 staff who work at the site. The most recent development regarding the future of the site is the proposal of local landowner, Robert Staveley, to create a car park and a visitors centre plus, more controversially, a 'transport system' around the site and to recreate the southern most henge so that visitors could see how it would have looked when it was built more than 5,000 years ago.